The 1.5 GHz dual-core version of the Samsung Galaxy S II is coming soon to Telus. It's called 4G Samsung Galaxy S II X. The super smartphone officially got its "Coming Soon" page. In addition to the super fast CPU, Telus Samsung Galaxy S 2 X runs on Android 2.3 Gingerbread with Samsung's own Touchwiz UI. The device boasts 4.5-inch super AMOLED plus (800×480) touchscreen display, 8MP camera with LED flash + capable of recording full 1080p HD video, 2MP front facing camera, 16GB internal memory along with up to 32GB expandable memory, and will also support the 42 Mbps HSPA+ upgrades Telus recently launched in Atlantic Canada. As for the size, it measures 67.3 x 131 x 9.4 mm and weighs 109 grams. The battery provides enough juice for up to 9 hours of talk time and up to 620 hours on standby. 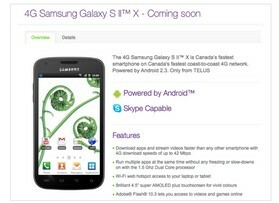 For more information about the 4G Samsung Galaxy S II X you should head over to Telus. 0 comments on "Telus Galaxy S II X with dual-core 1.5 GHz processor"